The appeal, signed by President Mnangagwa, highlights areas in which the Government is seeking assistance. For food and nutrition, Government is seeking US$292 million. “In view of the destruction of crops and livestock, the affected households require support up to the 2019/2020 harvest,” reads part of the appeal. 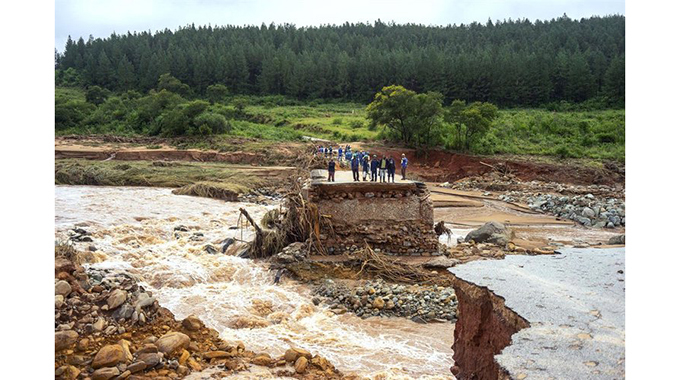 With regards to water, sanitation and hygiene, Government said the massive flooding left a trail of destruction on water supply infrastructure which crippled access to sources of safe water. As such, there is also need on the development and implementation of waste management plans and a total of US$51 million is required. Another appeal is covering shelter and non-food items. In this area, Government said some households would require relocation to safe areas necessitating the construction of new houses and related social amenities. “The emergency requirement for tents, schools, health facilities, non-food items and other social amenities amounts to US$75 million. Health service provision with special focus on maternal, new born and child health and prevention of epidemic prone diseases and medicinal requirements among others required an estimated amount of US$5,1 million. On the education side, the appeal highlighted that furniture, computers, teaching and learning materials were destroyed. As such, to facilitate learning in the affected areas, there is need for a rapid response targeting teaching and learning materials amounting to US$10 million. Logistically, roads and telecommunication lines were destroyed. Temporary access roads are required to ensure bulk delivery of relief aid. “The loss of electricity has affected the cold chain vaccines safety, water reticulation and other essential social services,” the appeal states. Another US$4,5 million is required environment, forestry and wildlife restoration.